Criticising Donald Trump has quickly become the world’s premier pastime. We’ve all participated in the activity, because it’s fun, because we enjoy it, and most importantly, because we’re always in the right. He’s a racist that enabled the rebirth of American Nazism, he uses trite barbs to cover the obvious fact that he’s obviously not that good. He’s bad, so he should be informed of that fact, right? The truth is that we’ve now reduced ourselves to the level of schoolyard bullies. Our articulate and well thought out talking points are long gone, as we’re now just picking on the fat kid because he’s fat. We laugh in his fat face and jiggle his love handles, pointing out the wobble to our chums because he said it was all muscle. For those who missed the initial schoolyard rumour, the student body believes that the White House doctor lied about Donald’s, because that medical professional gave “45” the thumbs up, despite Trump’s noted love of fast food, soft drink and unflattering golf slacks. 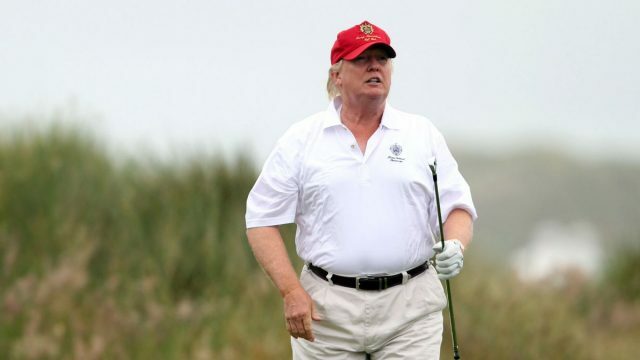 The resulting diagnosis from Twitter physicians suggesting that the doctor lied has even birthed a new term for those who believe that the President weighs more than he admits he does: the girther. On the back of this, Donald has now shifted from the uber-bully to the prototypical schoolyard victim. I now empathise with the man, because I’ve been him, we’ve all have. The tubby/weird/odd kid that no-one likes, one who manufactures lies in an effort to ensure that the empty space on lonely bus journeys home is filled with small talk. All we see is the liar on top of everything else. It doesn’t help that he comes from money, or that he plays a weird game endlessly for leisure. And he picks on the foreign kids, so whatever sandwiches we throw at him are valid. Plus, he won’t eat them, because it’s not a Big Mac. Fatty fatty fat fat. It’s the classic schoolyard economy. We don’t want him to try so hard to be our friend, because that’s a loser move, but similarly, we don’t want to be his friend, because he’s a loser. So, yes, we just want him to go away, or at the very least not speak to us for the rest of the school year. It annoys us when he can’t take a hint. But, I say we keep our criticisms it above the belt, not around his. Because there are bigger things that need our attention. Maybe we should focus on that wall he’s building in Mexico, not the one in his coronary artery.